Interplanetary Ratchet "The World's Biggest Ratchet in Action"
The rig took 4 days to build, but this sequence will thrill audiences with never before seen action. 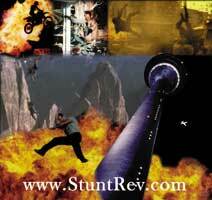 With the heroes right in the middle of the stunt, viewers will root for their stars without having to ever take their attention off the story. We assisted with the wire-work for this short for Dr. Pepper and the American Taekwondo Association World Championships. 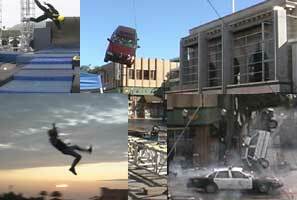 Watch the Fear Factor Live featurette. 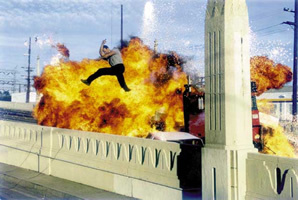 Stuntrev.com, Branam Enterprises and Monty Simons create the exciting stunt to open the Universal Studios Fear Factor Live attraction. Watch NBC Olympic Caravan with overall Olympic Gymnastics champion Paul Hamm. Paul Hamm's character flips over a balcony and does a 5 story jump to the ground after learning he has been selected for Team USA. Athlete's Foot driving you up the wall? How about 14 stories up? It does for this basketball player in a new Lamisil commercial. 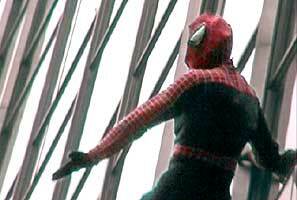 The location chose for this stunt was a tricky one, because they wanted to see him go up the side of a 14 story tall building. The tagline: " Lamasil gets you back in the game - fast." 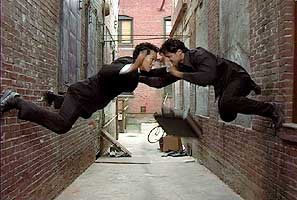 Look for this pilot of the new John Woo TV show filled with wire work and martial arts action. 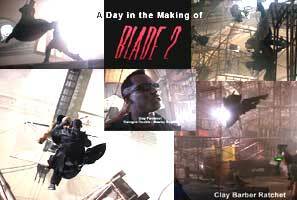 Blade II - World Stunt Award Winner, "Best Fight"
Watch A Day in the Making of Blade II to see a fight scene on the top of a catwalk featuring a descender rig carrying Wesley Snipes, villain double, the camera, and 40 ft. twisting ratchets. 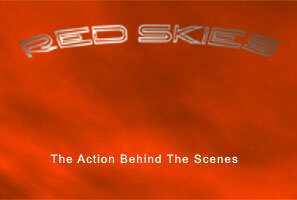 Watch a special sneak peak of the making of the action on Scorpion King. Chan on The Tuxedo. Andy Cheng choreographs. Demo Reel for Debbie Evans Leavitt. 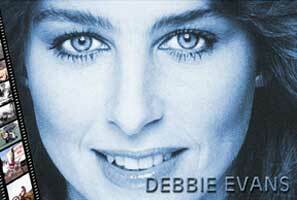 Watch the Debbie Evans Trick Riding Video. and photoshoot for Readers Digest. Debbie accepting a Taurus award for Best Overall Stunt by a Stuntwoman at the 2002 Taurus World Stunt Awards. Sophia Crawford rehearses a wire stunt for an upcoming show at fight central. 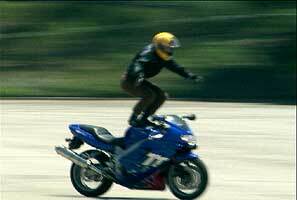 A tradional stunt performed in a whole new way. 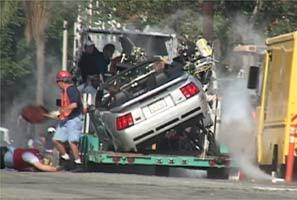 Device inside of car can be used where cannons and pipe-ramps cannot.